TV and theatre actress, Rokhsaneh Ghawam-Shahidi, plays the character of Leyla Harding in the ITV1 soap, Emmerdale. But many of her fans will probably be unaware of the fact that for the past 12 years she has been an enthusiastic exponent of yoga. YOGA CONDITIONING TOTAL BODY WORKOUT Roxy has created three unique 45 minute Yoga workouts. The workouts are designed to fit around your daily routine and are long enough to provide a balanced and challenging workout with the potential to produce some amazing effects. Written in a way to enable you to choose your focus according to your specific needs, the first workout focuses on full body whilst the second helps develop and strengthen the core and the third is lower body focussed. The workouts have been designed for intermediate levels but with options for beginners making the workouts very accessible for both levels. The workouts are dynamic but if you approach them with a calm focus you will also find elements of them relaxing and de-stressing. As Roxy suggests this DVD can be challenging for some, but be patient, respect your body and just go to your edge. With steady progress you will achieve some great results. Practising Yoga regularly has the potential to change your body and enhance your life. With patience and persistence you will achieve great results. Your body will be more toned and energized . 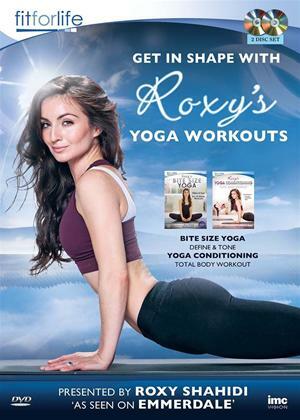 Roxy ROXYS BITE SIZE YOGA features 6 separate 15 minute Bite size workouts, designed for optimum results. Each one targets a problem area, with a focus on toning, energizing and then relaxing. The workouts are designed for all levels with flexible set programmes to accommodate most lifestyles and it is perfect for those who have never tried yoga before. The additional recipe booklet enclosed includes easy to prepare slim-line adaptations of household favourites, as well as dishes with a difference including Heavenly Granola, super food salad, Coconut Stir Fry and strawberry muffins. Roxy says, Not only is yoga a fabulous way to achieve and maintain a great body, I find it also helps create a calmer more focused mind. My aim was to create a DVD that will inspire everyone and help them to achieve the results they desire. Doing yoga daily and eating well very simply makes me look and feel good and that makes the rest of my life a lot easier. As a result my skin looks better, I have more energy and I ve shed excess fat. Bite size Yoga is a new fitness concept that enables you to really connect with your body, so you feel good in your own skin. She presents the exercises in a calm, clear and straight forward way. It offers something for everyone, for those who just fancy trying a little yoga or if you want a super-fit, slender, re-invigorated new you. This is a rational and sustainable approach to weight-loss; not a quick fix.